My older son has finished his first year of university. He attends Royal Military College in Kingston, Ontario where academics are combined with the four years of training which will help to sculpt him into an officer for the Canadian Armed Forces. His solid determination and unwavering patriotism fills me with equal parts of intense pride and undeniable fear. He's home for one final week of his thirty day leave, the longest time off that he anticipates having for the next several years. Training courses will occupy full summers from here on in. I try not to think about how much I miss him when he's not home. I also try not to think about where his military career will take him over the years, and what dangers he will encounter. I'm generally not very successful at not thinking. For this month, I'm simply enjoying his time at home. We've made a point of getting out and wandering around local conservation areas which are visually appealing and quiet. This time together allows us the chance to reminisce, catch up and share our mutual appreciation for nature. These mini excursions will be among the memories that I hope to recall when I'm trying not to think. 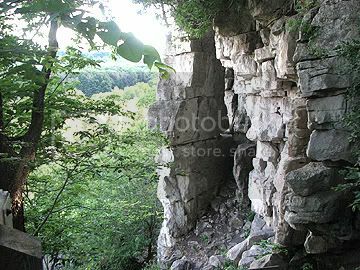 We brought the camera along on recent outings to a nearby marsh, and for an afternoon walk at Rattlesnake Point - a series of hiking trails that hook up with the 845 kilometre (525 mile) long Bruce Trail on the Niagara Escarpment. 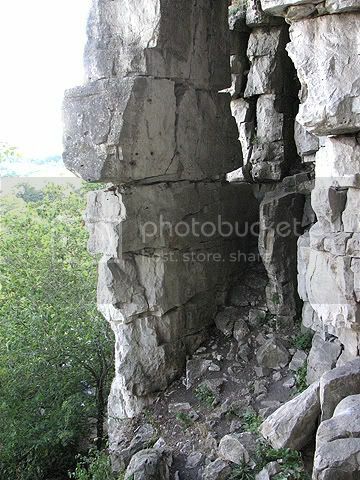 Rattlesnake Point is a popular spot for rock climbers, and though we didn't encounter many people during our walk, a number of groups or individuals can often be seen rappelling at various points along the way. 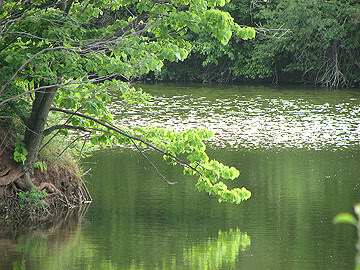 Rattray Marsh is Mississauga's wetland, which is located on the shore of Lake Ontario. 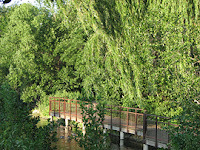 There are semi-rugged hiking areas as well as raised wooden walking paths that follow its shoreline. The area is home to a variety of insects, birds, amphibians and mammals, a few of which we were able to see, fewer still which we managed to capture on camera. 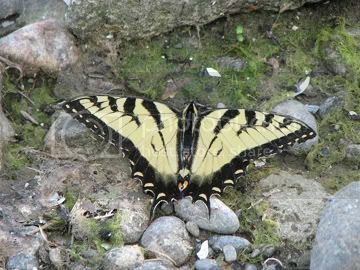 An Appalachian Tiger Swallowtail (or something very similar) lands briefly on the rocks and shows off its markings. 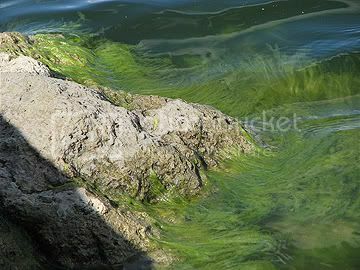 The sandy area below the rocks leads up to the lake where bright green moss is growing close to shore. 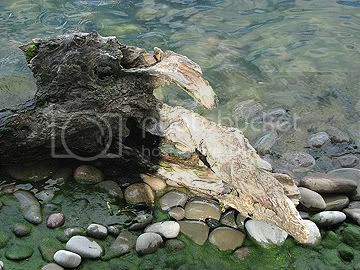 Gnarled driftwood contrasts with the smooth stones which were perfect for skipping across water, but I wasn't quick enough to capture the multiple splashes. We opted instead to toss some of the larger rocks out into the water. 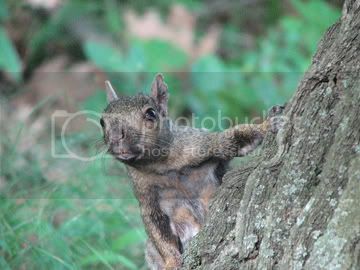 A moment later he was up the tree and poked his head around from behind, seemingly sticking his tongue out at us. The human attributes that we assigned him provided us with much amusement. 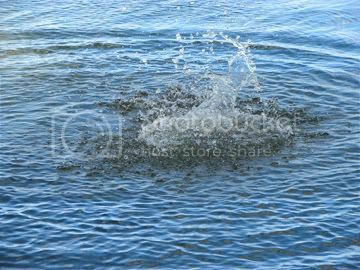 Before leaving for home, we stopped to watch as one by one, the ducks dipped their heads into the refreshing water. 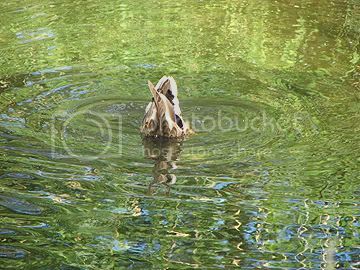 The reflected colours which surrounded this duck's bottom gave the appearance of an Impressionist painting. Summer is my season. My favourite time of day has always been the hour or two before dusk, when sunlight is golden and shadows are long. As a child, I spent those blissfully-warm, sunny months in the Laurentian mountains north of Montreal. 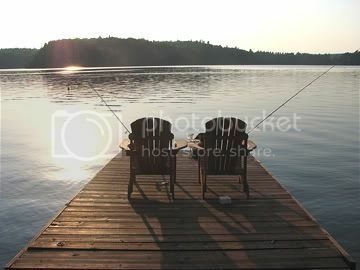 For several years, my family would rent a cottage from school-closing, right up until Labour Day. Those times are among my fondest memories. 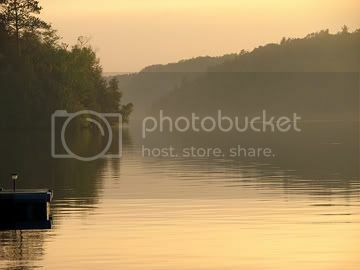 It's where my mind connects when I smell freshly-cut grass, an evening barbecue or a toasted marshmallow as it catches the flame of a late-night bonfire. The colours of the day remain vivid in my mind. Crisp blue skies and brilliant greens punctuated by the brightly painted-cottages which dotted the grounds. The lake and narrow strip of sandy beach were just a three minute walk down the dirt road. Sand-eating flip-flops often made their seemingly-endless journey from the road to the shore. Occasionally they would dangle casually from a finger while stubborn bare feet would stumble across sticks and stones on the beach. The lake was usually active with swimmers, boats and the occasional seaplane. Daylight hours were filled with rocks to climb, berries to pick, slide-glides to swing upon or the half hour walk into the nearby town to shop. We'd often visit the "Five and Dime" so that we could stock up on crafts or books for the next rainy day. I loved sitting in the screen-enclosed porch during bad weather, listening to the wind chimes respond to the stormy breeze. On those occasions, I would work on a mosaic craft or practice weaving the flat, plastic lace that we referred to as gimp. We were without a phone and television all summer, and I can't say that we ever really missed them. My father instilled in me a fondness for the night hours spent outdoors. He would work weekdays in the city, then drive up on Friday evenings to be with his family. I can remember many nights, leaning back with him in a single lawn chair looking up at the sky, swollen with shimmering stars. Often, we'd watch heat lightning entertain us as it flickered in the distance. I'd feel safe in knowing that the absence of thunder meant we could continue to observe the light show without risk. Dad's calm repose and reassuring arms helped to reinforce that security. Other nights, we'd take shelter as fierce storms rolled through, illuminating the room as if daylight had returned for one brief moment. It would be followed by a crash so forceful, I could feel the rumbling in my chest as it triggered a similar tremble of fright. I love, and am mildly fearful of thunderstorms to this day. The allure of cottage life through the decades has remained constant. The lake still draws us near, whether we swim, boat, fish or simply observe its beauty, sipping on a tall drink. A nighttime fire still roasts the best hot dogs, and a summer rain still tends to make us dash inside to read, or play a game of cards. My mind remains saturated with the sights, sounds and smells of the country from the summers of my childhood. Decades of city life have not managed to diminish their power to endure. In my own hours of golden sunlight just before dusk, they'll be there still. 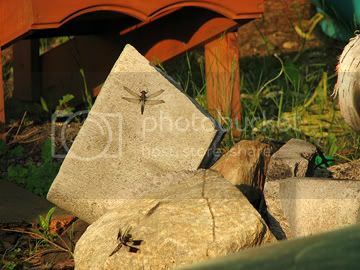 I had the pleasure of spending some time at a cottage in southern Ontario this past June, and of course I had my camera with me. 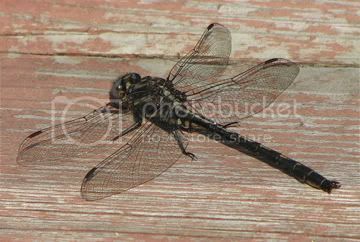 We arrived late afternoon, greeted by a squadron of dragonflies which, we were happy to know, were feasting on mosquitoes. They hovered, landed briefly and took off again throughout the remaining daylight hours. 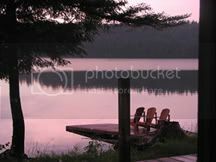 To me, the ubiquitous presence of Adirondack chairs is symbolic of cottage life, just as fishing rods are to others. 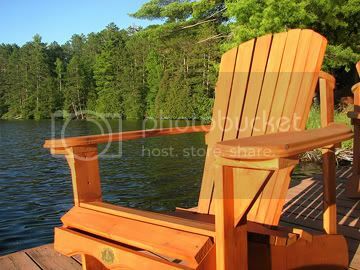 Here, a chair provides colourful contrast against the blue of the lake and the greenery of the nearby shoreline. 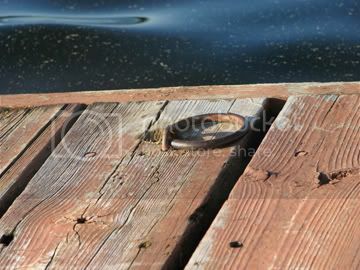 The edge of the weather-worn dock which has no doubt secured family fishing boats when happy anglers return home with their catch, and has launched many care-free bodies into the cool water beyond. After a late-day thunderstorm, the sun reappears just long enough to offer us a lovely sight at dusk. 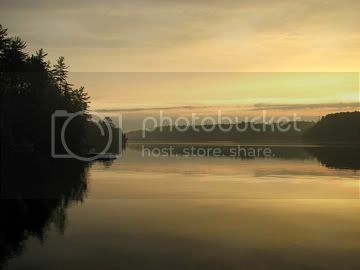 A distant pair of loons can scarcely be seen as they swim across the golden mist. Moments later, the sky deepens as nighttime falls. 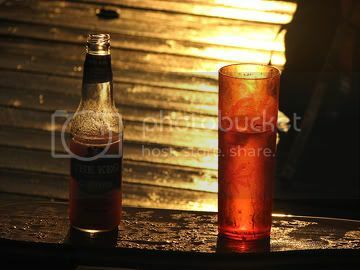 Wood glistens from the recent downpour, and the last rays of sunlight illuminate a bottle and drinking glass. Cheers! I live in what most would refer to as the suburbs of a fairly large city. We don't have a huge downtown core the way that more established cities might. Ours is less obvious because of its sprawling nature. Wikipedia tells me that it has doubled its population in the last two decades, which is almost as long as I have lived here, having moved from Montreal in the 1980's. Despite the cold, concrete surroundings that city life might imply, I am lucky to have settled into an area that is rich with greenspace and water. There's a lovely walking path that winds its way around a small body of water, located in the park just across the street from my home. I have always been inclined to call it a lake, mostly because the sign in the park which is named after it, refers to it that way. I have however been snickered at for doing so. My pond is is no more a lake to small town and country folk, than their block or two of village space can be called "downtown" to a city girl. Pond or lake, this small body of water with its surrounding green offers a hospitable location for a variety of plant life, and it attracts several different species of mammals and birds, including the often-seen, above-referenced Small Town Bearded Kvetch. I am grateful for my surroundings as they provide a calming escape from the sights and sounds of the enveloping city. It takes less than ten minutes to walk around the lake once (of the usual three tours) for exercise, but these days I tend to walk with my newly-acquired camera so that I can pause and snap images of any number of flora or fauna which can be found in these environs. The photos below were taken on different days but were all captured at my local park. Most any lake or pond in the area will attract ducks, geese, gulls and the occasional heron, and ours is no exception. 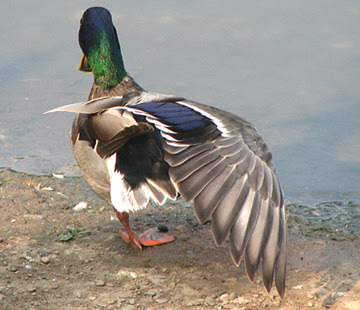 Here, a mallard stretches lazily, showing off his lovely colours. The feathers on his head can change from brilliant emerald to a rich, royal purple depending on how the sunlight strikes him. 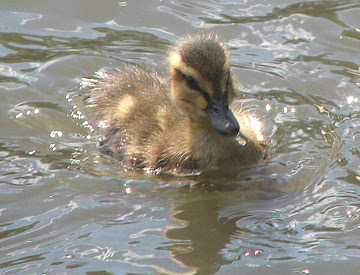 Early this summer, we were treated to the sight of a paddling of ducklings. There were seven of these downy little cuties, all of which appeared to have survived the local coyote population. 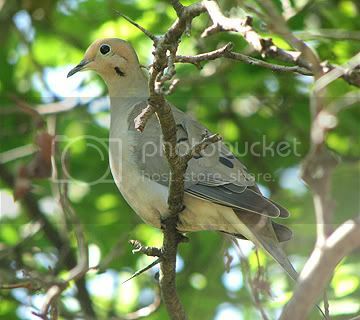 A mourning dove sits on a low branch, reflecting the golden colours of the late day sun. 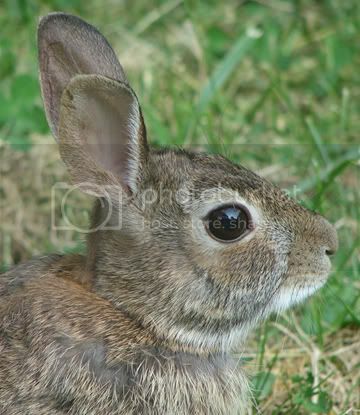 While strolling around the pathway one evening, I came across this bold little rabbit who stood his ground quite bravely as the camera lens and I inched closer and closer to him. I hope he would be a little less courageous should he encounter a coyote or dog at close range. 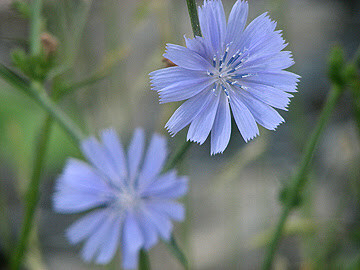 As summer evolves, plant life changes along with it. 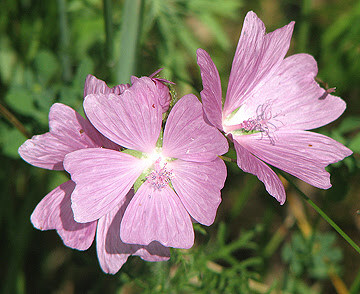 The pastel colours of early spring and summer are different than the deep purples and oranges that are common in late summer and early autumn. These flowers were enjoying the early morning sunshine of July. There's a particular spot along the path where I like to stop and absorb the sights from time to time. It's located just before a bit of a bend in the lake and offers one of the more appealing visuals in the park. The low branch of a tree extends out over the water to meet its reflection on the surface. 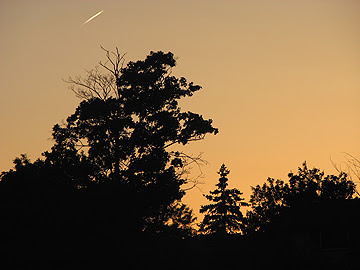 A view of the sky above the houses shows a distant airplane cutting a streak across the sky at dusk. Thanks for joining me on this walk in the park. The unusual collection of characters that have taken up residence on the header of this blog were all discovered at various garage sales between this summer and the last. Each one may have once been a gift to a friend, lover or child, eventually outgrown and ultimately sold for less than a dollar to the first person who could recognize the value they possess. That person was not me. These characters do however, live at my house. They sit atop various locations doing what they do best. They look goofy. Mostly, they just sit around and catch odd looks from those unaccustomed to seeing such unusual "art" scattered around my decor. Most people know that a black and white plush loon with red maple leaf-shaped feet is not what I would ordinarily choose to set off my impressionist art-covered purple(ish) walls. It's the farthest I would have imagined from a perfect fit, yet there's no denying he's truly Canadian, cute, cuddly and quirky. And he's grown on me. I expect that the Peking duck in the Chinese-style hat, the bespectacled, girly clown and the colourful fish might also endear themselves to me over time, but they're the new kids on the block, having only been discovered this past month. Time will tell. Of them all, the first one acquired was the mole, and he is indeed my favourite. He's also become the playing piece in an unexpected little game which mirrors the very nature of this squinty-eyed little creature. Moles burrow and hide, and this one is no exception. He appeared one morning, unannounced, peeking out from the inside of a decorative teacup. I immediately knew how he got there, and the smile that it evoked in me was for two reasons. He looked cute peering over the rim of the cup, and now, ... the game was on! I quickly found another location for him, hidden but in plain sight. It was about a week later when he was discovered and subsequently concealed again. We've been playing this game of hide-and-seek-the-mole for over a year now. The unspoken rules are such that he should preferably be happened upon rather than searched for. I have to admit that I had trouble finding him this last time. It took over six weeks and at least as many vague to blatant hints until I finally discovered him sleeping in a vase of silk flowers. Hidden but in plain sight. 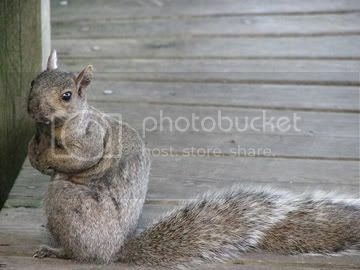 I've since given him a new hiding spot and he and I are patiently waiting for his presence to be discovered once again. I suppose it's easy to draw the parallel between these amusing little creatures and how we should consider the unlikely, lest they be the true treasures in our lives. Maybe that's why they have so unexpectedly but comfortably woven themselves into the fabric of my daily life. Perhaps the very best treasures are cleverly hidden but in plain sight.